JUSTNET (Justice Technology Information Network) is part of the research and development division of the United States Department of Justice. And as we all know, police and law enforcement need all the help they can get these days. With its in-depth video demonstrations, JUSTNET serves as an “honest broker” offering support, research findings, and technological expertise to help state and local law enforcement and corrections personnel perform their duties more safely and efficiently. If they are of interest to you, take a few minutes and watch videos on body armor, public safety radio systems, and even how to quell prison riots. There is also the Technology on the Job video [which] provides a look at some of the technologies undergoing research, development, and testing by the National Institute of Justice (NIJ). The technologies presented in [the] video include video evidence analysis, thermal imaging, geographic information systems, and DNA evidence. This last highlighted video is comprised of several segments. The Distillery will first point you to the introduction. However, among others you might find the segments on Video Evidence Analysis and DNA evidence interesting. In addition, the videos are offered for both Real and Windows Media players and also in three different bandwidths. Clearly, the information is intended to be readily available to all, regardless of computer resources. Nice job, DOJ. The Marines have marched from the Halls of Montezuma to the advertising agencies of Madison Avenue. At least so it appears from the U.S. Marines’ very excellent web site/recruiting tool. And although the site does not open with lights and sounds, plenty are to be found within. This site is very well designed. It is far beyond being “good enough for government work.” Subtle sounds keep dead air to a fair minimum. Louder background sounds do the same elsewhere throughout the site. Navigation around a very large site has been made quite manageable. In all, there are many little touches that take this site to excellence. And despite the war in Iraq and larger war on terror, the site certainly makes The Distillery feel All-American and very proud to be so. Look for videos highlighting the silent drill team, combat arms, the motto Semper Fidelis, the Marine Corps bands, and many other aspects of Marine life. You will find the many videos scattered throughout the sight with just enough frequency to keep one interested and looking. He answered former President Reagan’s call to tear down this wall. In doing so, he effectively ended a war which had occupied my entire lifetime–the Cold War. But, as a man of vision and possibly ahead of his time, Mikhail Gorbachev seems not to now occupy the best of positions in Russian history. That, with the passage of a few more years, may well change–and should. There have been few men as deserving of a memorable place in recent history as Mr. Gorbachev. Until then, we can still support Mr. Gorbachev through his Gorbachev Foundation. Even better, on March 2, 2007, you can help celebrate a great man’s 76th birthday. Happy Birthday, Mr. Gorbachev. And, thank you. Because the road to freedom isn’t paved! – Oshkosh Truck Corp.
On the other hand, the repetitious drum beat heard on the site’s home page quickly becomes a severe hurt on one’s ears. And unlike the best of sites, there is no “Off” switch for a very irritating soundtrack. Not good, so let’s get beyond the index page as quickly as possible. Moving on, we find Oshkosh feels Our Soldiers Deserve the Best and Oshkosh Is Honored to Deliver It. The slogans are a nice defense-related tie-in for its online advertising. The soundtrack is initially appropriate, but once again quickly grows old as it ends with the sound of machine gun fire and then repeats ad nauseum. But, we do find Oshkosh recognizing the value of the internet for online promotion with this video of its newest severe-duty military truck. One also finds video of the world’s only electric hydrid [sic] drive designed esepcially [sic] for severe-duty trucks. In addition, there is video of the computer-controled [sic] multiplexing system that operates and diagnozes [sic] all vehicle systems. Not to leave potential buyers asking too many of the more obvious questions, we find more video of the independent front suspension that provides three times a smoother ride in Oshkosh trucks. Additional video(s) can be found here and here, and in other places throughout the site. But before you leave, be certain to also visit Oshkosh’s TerraMax site. There you will find videos of its DARPA robotic vehicle. In all, very nicely done–excluding the countless and inexcusable spelling errors–for an 85 year-old company that does not sell what one might consider high-tech products. However, someone at Oshkosh needs to be shown the spell-checker on their computer. Or, that’s one pathetic advertising agency that allows such obvious and embarrassing spelling errors out the door. The Distillery certainly will not ever recommend or hire that advertising firm. The above caveat aside, it appears they make far interesting products and advertising in Wisconsin than just the state’s superb dairy products and children’s clothing. I knew there was a reason The Distillery liked that state beyond its frigid temperatures. And remember, the road to freedom isn’t paved. I have never been entirely certain what to make of The Honorable Minister Louis Farrakhan. However, that is from a perspective of personal beliefs. What about from The Distillery’s perspective? There we find certainty. …an alternative to the narrow one-sided ‘Middle East’ reporting of CNN, FOX, NBC, ABC, CBS, NPR and others. Visit LinkTV for news from the Direct perspectives of Lebanon, Iran, Syria, Israel, etc. The Distillery finds a virtual cornucopia of other rich media content. In fact, it finds an example of the very sort of rhetoric (September 11, 2001: Fact and fiction According to Loose Change Documentary) that gives pause to fully endorsing Minister Farrakhan, although he proclaims himself a scholar and vessel of truth. On the other hand, one finds a link to an unedited CBS 60 Minutes interview with Iranian President Ahmadinejad. Elsewhere throughout the site, numerous and diverse webcasts, interviews, and podcasts are found. Whatever your ideological feelings about Minister Farrakhan and his mouthpiece, FinalCall.com News, you must agree both are instep with technology as a tool to reach (and preach to) the masses. Both make their messages more accessible than what we find from many Fortune 500 companies. 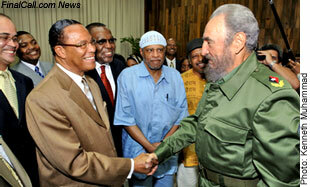 Well done, Minister Farrakhan and the Nation of Islam. Were The Distillery xenophobic, China would be scaring the dickens out of it right now. There is no doubt that China is becoming a dominant player in the world’s markets–military, space exploration, political, economic, and otherwise. That assessment seems very evident when looking at Weichai Power, a manufacturer of diesel engines in China’s Shandong province. One finds an interesting mix of both Oriental and Occidental at its web site. Although the voice-over is in Chinese, the firm uses images of famous Western scientists–Archimedes, Newton, and Einstein–in an online video promotion. The Distillery finds that interesting considering all of the inventions by the Chinese themselves. (To name only a few–the abacus, paper, Indian ink, gunpowder, and the compass.) Clearly, Weichai Power is looking beyond China’s national borders and out to the larger world market for buyers of its diesel engines. And quite frankly, given labor costs in China, Weichai Power’s engines may well be excellent engines at prices western firms will have difficulty matching. Even more, it appears the Chinese government is using the firm and their close relationship to tout China’s every-increasing modernization. For example, have a look at this television ad which highlights China’s beautiful new passenger train (powered by Weichai diesel engines), wind farms, construction projects, and modern cities. And quite frankly, that is a bit scary. Is China not doing the same as Japan by closely partnering private enterprise with government? Will that provide China essentially the same advantages enjoyed by Japanese firms with their close government and national banking ties? The likely answer is yes. Caterpillar, meet Weichai, your newest nemesis–or partner, if you’re smart. Home page: Weichai Power Co., Ltd.
One day, Spike Lee will make a great movie. No, not “very good” like many of his previous cinematic efforts are, but a movie on par with movies made by John Huston, Steven Spielberg, and Francis Ford Coppola. But until then, “very good,” “superb,” “insightful,” and “excellent” must suffice as descriptors of his works. From all The Distillery has seen and read about Spike’s most recent effort, When The Levees Broke: A Requiem in Four Acts, he has again produced a superb film. It has that look which The Distillery finds unique and unmistakably “Spike Lee.” It is also “Spike Lee” in that he does not hold himself to a strict timetable. This HBO documentary is four hours long. Still, do the right thing and set some time aside to watch it. I grew up in a very small North Carolina town. My high school graduating class numbered approximately one hundred students. (However, I am a high school drop-out. And yes, I’m proud of that. High school was a waste of time.) What wasn’t a waste of time was looking up into the sky at night. One of my fondest memories from childhood was looking up and seeing the Milky Way very clearly. It was as if someone had taken a paint brush and lightly painted a white streak across the sky from horizon to horizon. The Milky Way was a huge, faint white cloud visible at night, a cloud of stars. Even before Hubble’s Deep Field photograph and Carl Sagan (…billions and billions of stars), I somewhat comprehended the immense vastness of space. Dear readers, if you have never clearly seen the Milky Way at night, you are missing something truly spectacular. Do try to get away from city lights and see it for yourself one day. You will not be disappointed. Those memories are stirred by this presentation, An Infrared Search for Origins, made possible by NASA’s Space Infrared Telescope. I will let the universe speak for itself. I hope you enjoy the presentation as much as I. 2005 was a banner year for weapons suppliers like Boeing and its Integrated Defense Systems division. The Distillery can find no joy in that observation. The Distillery has been found to be lacking once again. There are some products which are never considered for inclusion here. It’s not because they are disliked, it’s just they are never considered. That’s when serendipity comes to the rescue. MedJetAssist is an emergency medical air evacuation insurance service which operates around the globe. (Great idea!) The company will fly you to any hospital in the world and also cover repatriation (if you are overseas), as long as you’re at least 150 miles from home. The service has even caught the attention of Fox News. Pricing? Very reasonable considering the service offered. Have a peek at this video of Governor Schwarzenegger, a.k.a. The People’s Governor, visiting heat-beleaguered farmers in California’s Central Valley region within the past week or so. (He’s not wasting time getting those videos online, is he? As noted, he knows the power of video.) You might next have a gander at Gov. Arnold announcing the creation of the California Hall of Fame.